Commodore 64 emulator for the PSP. - Subdirectories support. User can now browse any directory of the memory stick. - Add autofire option. Two speeds available. - Small speed improvment (unfortunatly still not enough for some few games like Cauldron2). - PSP icons are hidden now ( __SCE__ method ). - .NFO Comments fully displayed. - Fixed crash when using game files with very long file names. - Disk files can be saved, but this need to be done manually (by detaching disk). Menu is now more clear and doc on web page describes how to save disks (the feature was in PSPVice1.0). - P00 files can be launched now. - Plus4 and Vic20 are rough ports. Need more polishing. Thanks to all people that mailed me suggestions and bugs reports. That helped me creating that new version which is now really good. Check the new sound, it is just Wooooow. - True drive emulation. List of supported games is now same as Vice (hugeeee). - Save snapshot on MemoryStick. Allow 4 saves for 1 game. - Improved disk/tape browser with screenshots and info file. Can also display .nfo file from gamebase game archives. - User can change keymapping and save/load it. Any shortcut can be assigned on any key. 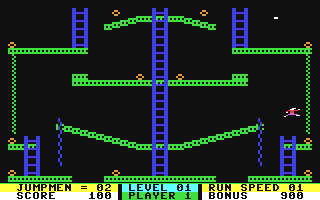 - Save to disk (from C64) is now working. You need to detach disk image or attach another image to save the disk image to memory stick (or it will stay into memory and will be lost). - 333 Mhz mode is available in menu. - Add fullscreen modes (croppped / stretched). - Sound stopped when in menu or pause. - problems with "true drive emulation" option (not working at all). - Some (perfectly working) disk images fail to load with "?LOAD ERROR"
- Virtual keyboard on triangle button. - problems with "true drive emulation" option. 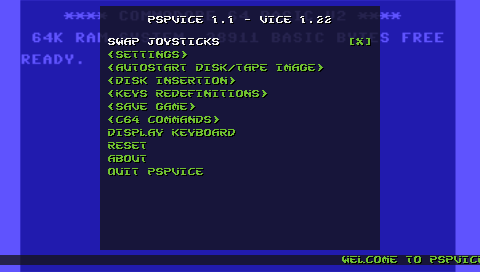 Swap Joystick : Use this function the swap the main joystick between C64 port 1 and 2. Sound Enable : Turn off / on the sound. This may help to fasten some games. PSP Cpu Speed : Use 333 Mhz to get the best performances. PSP Video mode : How the C64 screen is mapped on your PSP. Full screen or not, with or without borders. Smooth pixels : Use this to have a smooth transition between pixels. Disable it if you want to see all C64 pixels. Video Standard : Allow you to boot a PAL or NTSC C64. 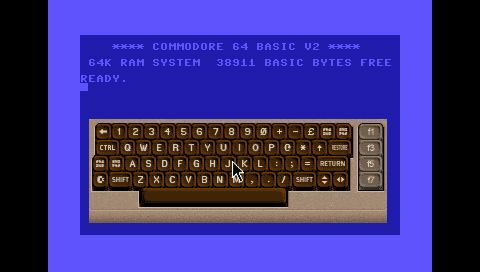 Load Palette : To change the PSP Vice C64 colors. 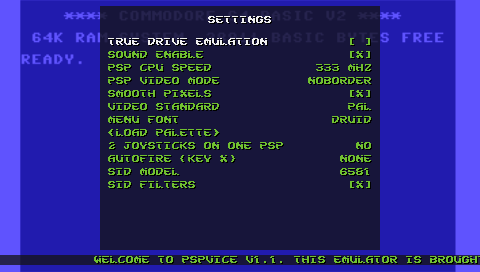 You can add you own palettes adding a ".vpl" file in the PSPVice\PSPViceDatas\c64sys\ directory.